Springtime view over the agora and theatre of Morgantina. In recent posts, I have written about two ancient Greek cities, each of them special and fascinating for its own reasons. The first was Lato in Greece, namely on the island of Crete, notable for its clear reflection of the basic structures and characteristics of an “Archaic” Cretan state. 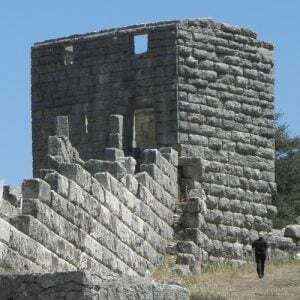 The second was Priene, near the Ionian shore of what is now Turkey, arguably the most comprehensive and comprehensible example of a complex Greek polis or city-state, presenting the full urban context of its public buildings, shrines and private homes. 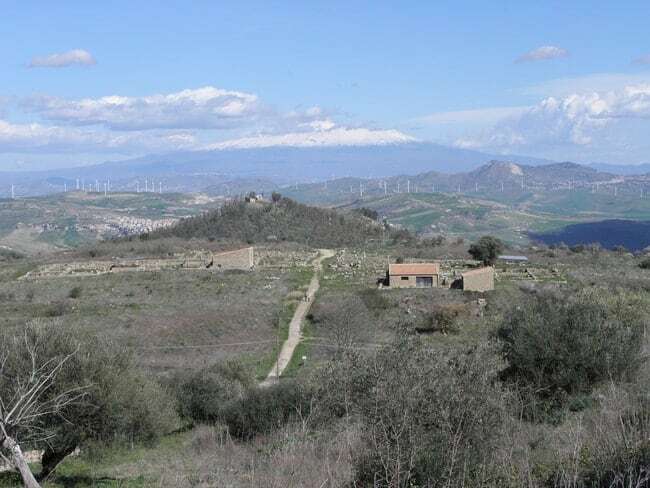 View across Morgantina’s West and East Hills towards Mount Etna. Today, I add a third, this time in Sicily. 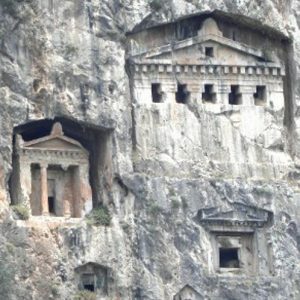 The island was home to numerous cities founded or settled by Greeks during the 8th and 7th centuries BC, leaving behind a rich legacy of architectural remains, especially the many well-preserved temples. But the site at the focus of this post has reached prominence for other reasons. It is Morgantina in East Central Sicily, known for the extraordinary wealth of archaeological finds brought to light there in recent decades, but also exemplary as a more or less Greek city existing on the periphery of the Greek World, in constant contact with other cultures and with a specific history that was always influenced and eventually determined by those contacts. 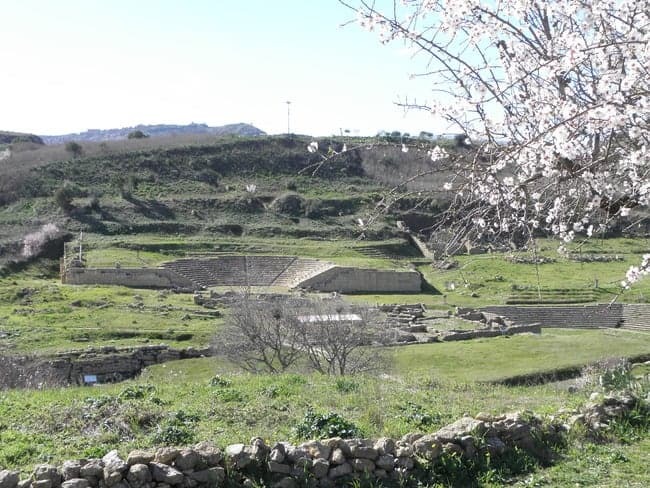 Morgantina is located in the rolling hill country of East Central Sicily, about 60km (37mi) inland from the island’s eastern coast and 45km (28mi) from the southern one. The ancient settlement is located on and between a series of hills overlooking some of Sicily’s most fertile terrain. 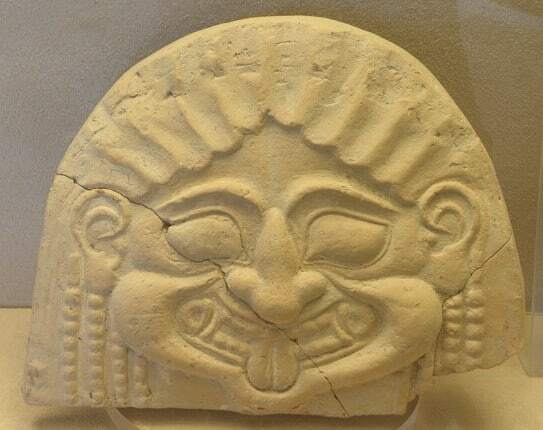 Gorgon’s head belonging to a 6th century BC roof decoration, probably from a shrine or public building. Unlike Lato or Priene, Morgantina did not come into existence in its present location abruptly, as a new foundation or refoundation. 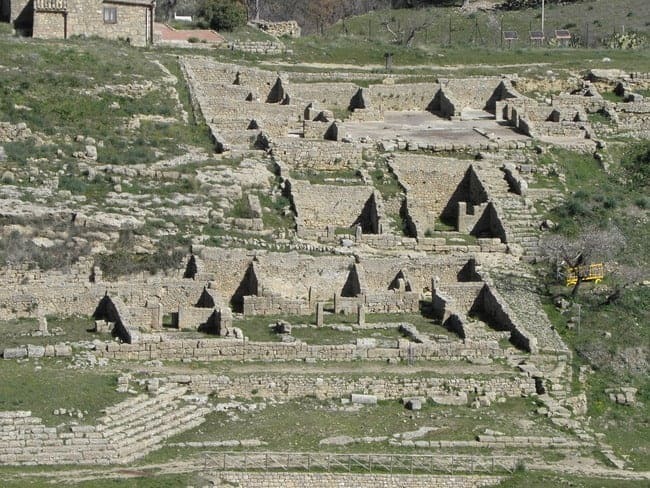 In fact, the area was already settled before the advent of history, in the Early Iron Age (around 850BC), when Sikels, the native inhabitants of Sicily, created a village of the period’s typical local long houses on Citadella Hill. Although Morgantina does not appear to have been formally (re-)founded as a Greek colony, it was affected increasingly by the Greek presence in Sicily. By the 6th century BC, Morgantina begins to show a strong Greek influence, indicated by the construction of a Greek-style urbanised settlement on the same hill. It featured mudbrick-on-stone houses, shrines with terracotta-tiled roofs, and its graves contained much imported Greek pottery (e.g. from Corinth, Sparta and later also Athens), along with local wares. It is noteworthy that these features initially coexisted with the traditional Sicilian longhouses further downslope, perhaps indicating a coexistence of different ethnic backgrounds or lifestyles. 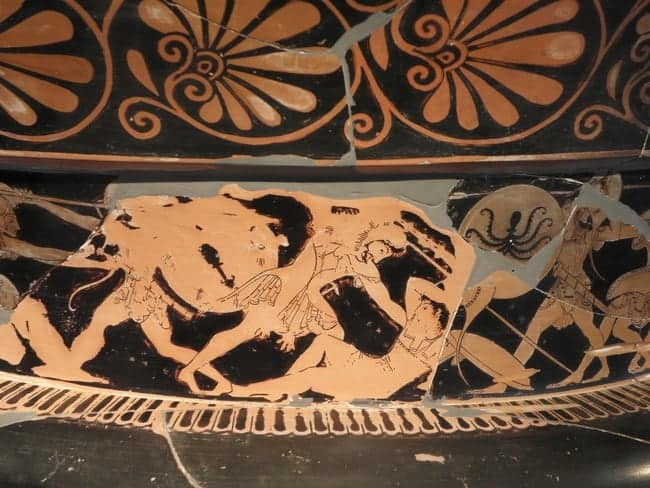 Herakles (Hercules) in battle against the amazons, late 6th century krater (wine-mixing vessel) by Euthymides, an Athenian painter/potter. (Aidone Museum). This first city of Morgantina was destroyed by fire around the middle of the 5th century BC, almost certainly due to its 459 BC conquest by Douketios, a local Sicel leader who tried to liberate the region from Greek control. Apparently already during his 10-year rule, the city was refounded on the Serra Orlando ridge, a short distance west of the earlier settlement. Ironically, the new city was designed very much along the lines of contemporary Greek city-planning, with houses of equal size arranged along a rectangular street grid, a large flat area reserved for the agora or marketplace, as well as various sanctuaries scattered throughout the settlement. 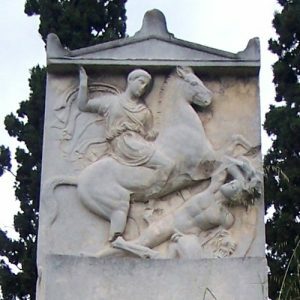 Douketios’ plans eventually failed and Morgantina fell under the influence first of Kamarina and later of Syracuse, which was to dominate for nearly two centuries. 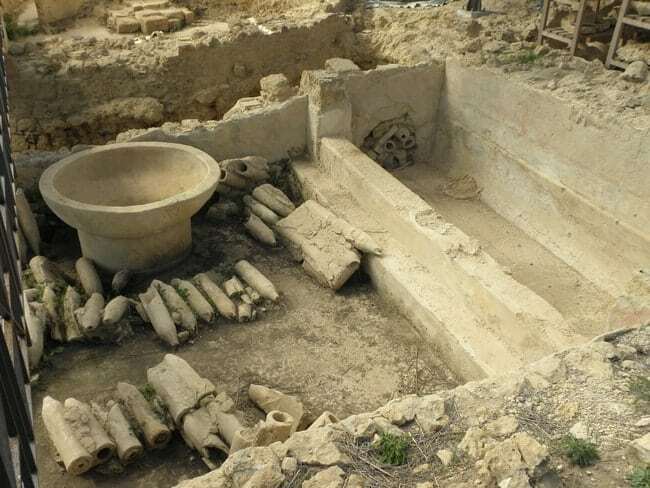 The 4th and 3rd centuries BC were a period of affluence and growth for the city, as indicated by rich archaeological finds, including finely decorated homes. The population may have reached up to 7,000 at the time. But all good things come to end: in 211 BC, having sided with the Phoenicians during the 2nd Punic War, Morgantina was conquered and partly destroyed by the Romans, and its population replaced with Spanish mercenaries. The town, now known as Murgantia, continued to exist at a smaller scale than before until the late 1st century BC. In the struggles following the murder of Julius Caesar in 44 BC, Morgantina once again chose the wrong side, opposing the future emperor Augustus. The city appears to have been punished harshly; by the 1st century AD it had shrank into a small village. Residential quarter on the East Hill, with large homes centred on pillared courtyards. Morgantina has been undergoing excavations, mostly by American archaeologists, since the 1950s. Today, it is a beautiful and fascinating site to visit, set in a highly attractive landscape, with views across Sicily’s fertile hill country to Mount Etna far to the East and – on a clear day – the sea to the South. The site does not (yet) offer quite as comprehensive a picture as Lato or Priene do. This is the result of its large size, of the still-limited area excavated and of centuries of agricultural activity having obscured some of the remains. For example, the city walls, usually such a strikingly defining feature, are known only in part and cannot currently be experienced as part of a site tour. Nevertheless, the extent of the settled area and the underlying constellation of street grid, private homes, public spaces and so on is readily appreciable. The centrepiece of a visit to Morgantina is the focal point of the 5th to 3rd century BC city: the agora, set in a dip between two hills and surrounded by various public buildings, is overlooked from the East and West by slopes on which fine private homes are set. The rigidly rectilinear street grid, blithely ignoring the natural contours of the terrain, is evident in those residential quarters. Between their lanes, the visitor can explore the stone foundations of a series of houses, with central pillar-lined courtyards surrounded by various smallish rooms. The superstructures were made of mud-brick and are now lost, but here and there stairways indicate the existence of upper floors. In some cases, details such as underground cisterns, decorative wall paintings, simple pebble floors or elaborate mosaics are preserved. The agora, with the theatre on the right, the sanctuary of Demeter and Kore right behind it, followed to the left by the ekklesiasterion steps and the macellum. The residential quarter on the East Hill is in the background. The agora itself is a picture-book example of its kind. Typical for an urban space of its period, it was surrounded by colonnades or stoas. On its edges are various structures to do with the administration and government of the city, such as the prytaneion, the formal residence of the main magistrates and the bouleuterion or council chamber. A highly striking set of angled steps may represent the eklesiasterion, meeting place for the full assembly of citizens. Part of the central space is taken up by a sanctuary to Demeter and Persephone, underlining the ritual function of this central public space. An impressive theatre, connected to the cult of Dionysos, illustrates the mixture of civic and religious activities that define the identity of an ancient Greek city. Detail of the Hellensistic bathhouse, with clay heating pipes, a basin and a built-in pool. Various later additions are found around the agora. They include an enormous granary, probably a 4th century BC construction serving the complex Syracusan tithe-collection, a Roman food market or macellum, and a pottery kiln dating to the latest occupation of the site. Beyond this central area, it is also possible to visit a remarkably well-preserved Hellenistic (3rd century BC?) bathhouse in the western part of the ancient city. With its water supply system, underfloor heating, basins and pools clearly visible, as well as traces of very elaborate decoration, this is one of the best examples of its kind worldwide, a rare piece of evidence for the development of complex bathing culture in a Greek context, before its standardisation and wide distribution by the Romans. 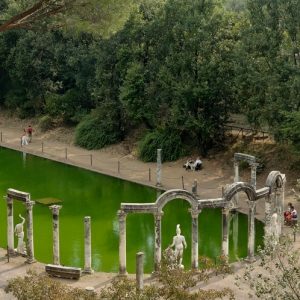 The enterprising visitor can also explore Citadella Hill to the East, with remains of the prehistoric and Archaic settlements preceding the 5th to 1st century BC site, crowned by the remains of a 4th century BC temple. The late-5th century BC Classical “Venus of Morgantina”, recently repatriated. Another key attraction of Morgantina is the fact that, in contrast to Lato or Priene, it has a designated site museum, set in the nearby medieval village of Aidone and housing an astonishing array of finds. It is always a boon to be able to see excavated material in context with the site it originates from, but Aidone/Morgantina takes this privilege to the extreme. The museum, overall, is a testament to diligence. On the one hand, it stands for the diligence of the mostly American scholars, both in working on the site and in convincing the Italian government to provide a local exhibition space to display the material from Morgantina. Well-organised exhibits showcase the results of systematic excavation and study, presenting the history of the site and many objects from the everyday life of its inhabitants as well as items laid to rest with them in their graves. But as things turn out, the museum also showcases the diligence of illicit excavators (aka looters) and international art dealers in distributing extraordinary finds across the wealthier museums of the Western World, followed by the diligence of the archaeological community and of the Italian authorities in securing the return of such plundered objects. The museum contains a whole series of key finds that have recently been returned to Italy after spending time in museums abroad. The astonishing Hellenistic Morgantina Treasure, a collection of Hellenistic gold-and-silver items, had been buried under a house floor just before the Roman conquest of Morgantina (and was returned from the Metropolitan Museum in New York in 2010). It is nearly unique as an ensemble of such precious items, perhaps once the property of a sanctuary or of the priesthood serving a local shrine. The “acrolithic” statues of Demeter and Persephone (6th century BC). The breathtaking “Venus of Morgantina”, an exquisite late 5th century BC statue of a lady (perhaps Persephone or Demeter, but certainly not Aphrodite or Venus) represents a high achievement in Classical Greek art (and was returned from the Getty Museum in 2011). Most impressive for me, however, are the marble heads, hands and feet of two late 6th century BC “acrolithic” female statues, whose bodies were made of other materials. 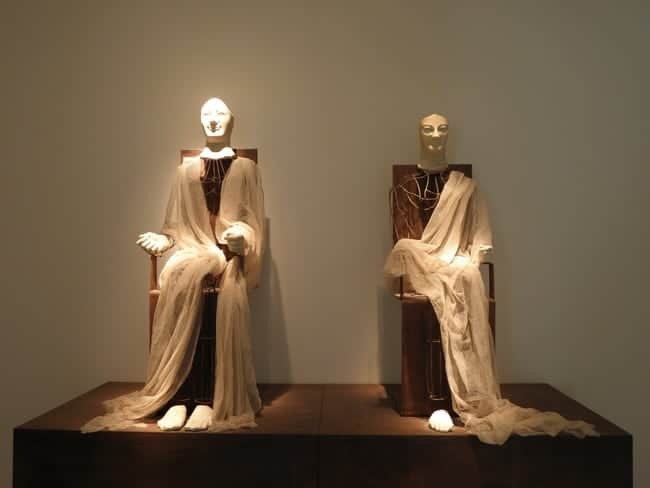 Returned by the University of Virginia in 2008, they were the cult images of Demeter and Persephone in a shrine outside the city and count among the key pieces of Archaic Greek art from Sicily (and featuring the Archaic Smile). Morgantina is a key site for any visitor interested in Sicily’s ancient history, and for anyone fascinated with ancient art. You can see it as one of many highlights on our Exploring Sicily tour. My wife and I visited both the site and museum today and were dazzled. You mentioned many of the highlights but another one which stands out is the head of Hades, also looted, sold to the Getty Museum in LA and now back where it belongs. As it is in terracotta, it still has some of the vibrant red in the bust’s hair and bright blue in the beard (Bluebeard?). 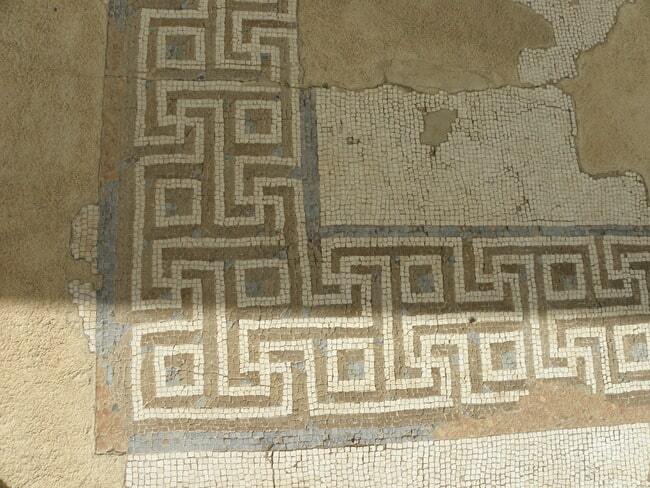 Anyway, a fascinating day and tomorrow we visit the Roman villa with its extraordinary mosaics…thank you for your terrific blog.